Adkins Professional Lighting's 3 watt LED Pinspot uses highly efficient LED lighting technology with lighting power equivalent to much higher powered conventional lights. Plus, the LED's 50,000-hour lamp nearly eliminates the need for replacement bulbs. Using LED technology instead of a standard halogen lamp makes the LED Pinspot nearly maintenance-free and very energy efficient, significantly lowering operating costs. Thanks to the use of LED technology this unit runs at a cooler temperature. The LED Pinspot can be used for highlighting objects such as a wedding cake, table settings, retail store product displays or point it at a mirror ball for a room covering sparkle effect. 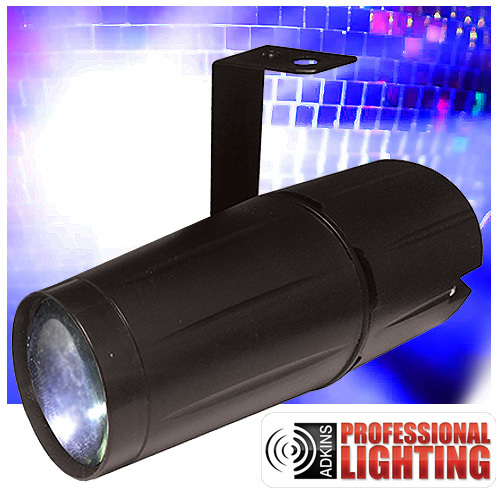 The bright, focused beam is perfect for a variety of lighting applications. Why use just one? At the extremely affordable price of this light you can light up an entire room while using very little power. Featuring a 6 degree beam angle, the LED Pinspot is easy to aim at objects you want to highlight. The Pinspot LED's compact size and multitude of uses make it a must-have in your collection. Size: 5.625" x 3" x 3.75"